Hundreds Of B Corps Are Sitting Ducks. Here’s Why. 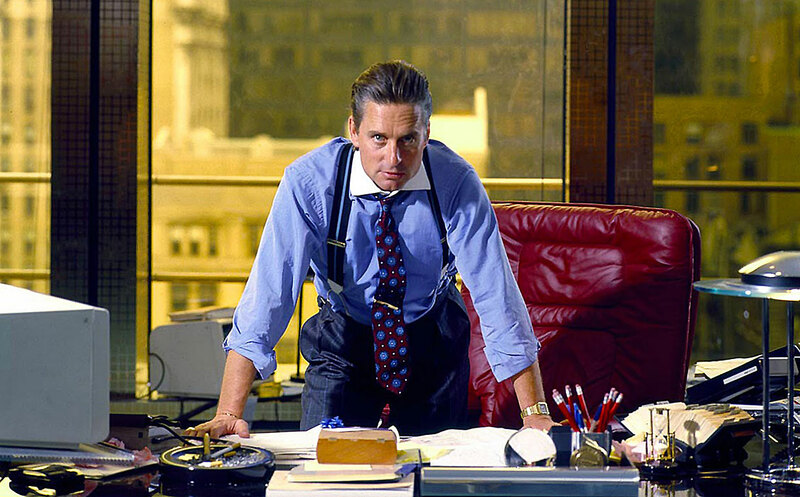 Michael Douglas as the financier Gordon Gekko in Wall Street (1987). Entrepreneurs who are growing the Certified B Corps movement need to learn from their elders’ mistakes. But B Corps in 18 states have no defense against corporate predators. And in 11 of these states, they’re fooling themselves. At the end of 2015, 31 states have passed laws establishing benefit corporations. These are different than B Corps, which subscribe to a voluntary certification program maintained by a not-for-profit group called B Lab. Benefit corporations have taken the next step by writing their double bottom line into their articles of incorporation. They exist to make a profit for their shareholders, but also to benefit their stakeholders—employees, suppliers, customers, and neighbors. In most states, benefit corporations are also required to prove their social impact in public reports. The first law establishing benefit corporations was passed by Maryland in 2010. While the movement is spreading rapidly, 19 states have not yet passed a version of this law. But Georgia, Iowa, Kentucky, Maine, Missouri, New Mexico, North Dakota, Ohio, South Dakota, Wisconsin, and Wyoming have an older law on the books that some view as a substitute. It’s known as a non-shareholder constituency statute, and it explicitly permits corporate directors to consider the effects of their decisions on stakeholders as well as shareholders. Constituency statutes might sound good, but they don’t protect mission-driven businesses. “They haven’t been cited in many court decisions,” says William Clark, an attorney who helped draft the original legislation for benefit corporations. “When push comes to shove, the shareholders always win. So there’s a real question at this point about what constituency statutes mean.” And thereby hangs a tale. The current crop of community-minded business people emerged when baby boomers started opening shops in the 1970s. The founders of Ben & Jerry’s, The Body Shop, Tom’s of Maine, Stonyfield Yogurt, and others succeeded by positioning their products as healthy, values-led alternatives to similar products made by big, greedy corporations. But when the big, greedy corporations offered to buy them out, the hippie capitalists couldn’t come up with a better alternative. Gekko’s speech came on the heels of Revlon v. MacAndrews, a Delaware Supreme Court decision that triggered a feeding frenzy among corporate predators. The Court held that once buyers begin bidding up the price of a publicly traded stock, corporate directors must disregard the interests of stakeholders and focus only on maximizing shareholder profits. The Revlon decision never made it to the US Supreme Court, and lawyers are still arguing about it. But when it passed in 1986, it was seen as the law of the land. Lots of community minded business people were horrified by Gekko and Revlon. They devised constituency statutes to give corporate directors a way to fight back. Pennsylvania was the first state to pass one, in 1983. Others followed quickly and today, 32 states have them on the books. But this wasn’t really a legal dispute. It was a clash of worldviews, and the well-meaning hippies never had a chance against Gekko. The directors of Ben & Jerry’s were forced to sell to Unilever in 2000, even thought the Vermont legislature passed a constituency statute in 1998. One big reason for the sale (described in my book) was the threat of multiple lawsuits from profit-hungry shareholders. “With the exception of Connecticut, constituency statutes are not mandatory,” says Clark. “They simply allow directors to consider other interests.” In other words, constituency statutes codify a large body of corporate law that says directors have the right to serve stakeholders as well as shareholders. But this legal right doesn’t mean much, once the money starts talking. Constituency statutes were the best we could do until the late 2000s, when Clark and several business people developed a better idea. Benefit corporations are legally required to pursue a double bottom line. They are now building enormous amounts of good will and loyalty by treating their employees, suppliers, customers, and neighbors well. They are also publicizing their good works as a way of distinguishing themselves from their competition. Many benefit corporations are highly profitable for this reason. If a profit-only corporation buys a benefit corporation, it could change the charter or absorb the assets. But a move like that would also endanger the very thing that makes the acquisition attractive. Changing a benefit corporation’s policies runs a serious risk of losing a lucrative market segment. This is because so many consumers will pay more for products that reflect their commitments to fair trade, a living wage, and other causes. These activist consumers are the ultimate guardians of the socially responsible business movement. Benefit corporations are their best choice, because benefit corporations are finding ways to grow sustainably without abandoning their stakeholders.